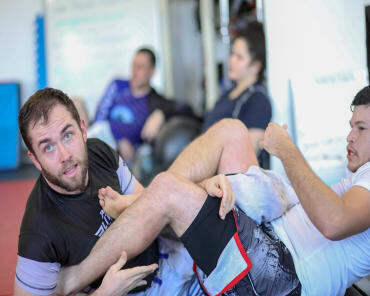 The first installment of how the owner of Radius Martial Arts Academy, Travis Passaro, began his BJJ journey. “What next?” This was the question that started me on the road to living the BJJ and martial arts lifestyle. You see I have always been an athlete - not the biggest or the strongest, the quickest nor the “go-to-guy” - but my body has always had the need to be in motion and athletics has been the key to my (and my parents) sanity…it is to this very day. So when my 12 year rugby career ended at age 31 I was really in a bind as to what to do next. I tried going to the gym, but found it to be completely unsatisfying. I missed the camaraderie of the rugby pitch. I missed the cohesive brotherhood that binds a rugby team like brothers. Most of all - and this might be hard for some to understand - I missed slamming my body into another person’s body as hard as my 145 pound frame could manage. All that was gone with only a question to help fill the void, “What next?” that and useless Fitness Edge membership card. In my next installment I’ll write about my grappling roots and explain how those roots brought me home to the mats for the very first time.